More than eight million children live in areas of the UK with illegal levels of air pollution, according to an analysis by the Labour Party. Some 8.3 million under-18s live in local authority areas where levels of harmful pollutant nitrogen dioxide exceeded legal limits in 2015, according to the Party, which made its estimate using figures from the House of Commons Library. Around three-fifths (61%) of youngsters were living in areas across the UK where pollution limits were breached in 2015, the estimates show. The analysis suggests some 2.5 million under-fives were living in areas of the UK with illegally dirty air in 2015, which is 63% of all children in the age group. 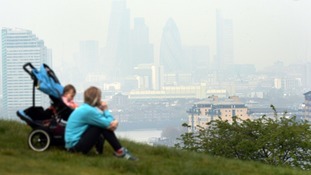 All children in London face illegal pollution levels, as the air quality limits were exceeded in all boroughs in the capital. Outside London, Yorkshire and the Humber was the worst affected region, with an estimated 83% of youngsters living in areas with illegal pollution, followed by the North East, North West and West Midlands. Ministers unveiled court-mandated plans for meeting the EU limits on nitrogen dioxide, much of which comes from road transport and particularly diesel vehicles, in July after a long-running battle with legal charity ClientEarth. The government was ordered to produce the latest air pollution plans after the courts ruled previous proposals were insufficient to meet EU pollution limits, which the UK has breached since the rules came into effect in 2010. But official estimates suggest compliance for levels of nitrogen dioxide will not be met until 2026. Air pollution causes an estimated 40,000 premature deaths a year in the UK and is linked to health problems from childhood illnesses to heart disease and even dementia. It is also thought to affect children's development. Sue Hayman, shadow environment secretary, said: "With the majority of our young people now growing up in areas that breach air quality limits it's clear the UK is in the middle of a dirty air emergency. "Dirty air is a clear and present health hazard; it can take years off a person's life. "Cleaning up our air should be a national priority, unfortunately this Tory government - which once promised to be the 'greenest ever' - has allowed the situation to escalate into a public health emergency on their watch. "We need to act, to protect the health of all our children and the wellbeing of the country. That's why Labour has promised a new Clean Air Act to get a grip on pollution before it's too late." An Environment Department (Defra) spokesman said: "Air pollution has improved significantly since 2010, but we recognise there is more to do which is why we have put in place a #3.5 billion plan to improve air quality and reduce harmful emissions. "We will also end the sale of conventional new diesel and petrol cars and vans by 2040, and next year we will publish a comprehensive clean air strategy which will set out further steps to tackle air pollution."